“I’ve had more than enough negativity in my life. It’s time to try on some positivity and level the playing field, lol! Maxwanette was reading on a High School level, by the age of 3 and started writing Poetry, at the age of 5 (Kindergarten~Public School 316, Elijah J. Stroud Elementary, Brooklyn, NY). Her first piece was a Haiku. She was so tickled by this form of Poetry, that she wrote many Haikus daily, driving her teachers and Mother crazy, lol! By the age of 8 (3rd Grade), her writing was already getting noticed in her Public School. By the time Maxwanette was 10 years of age (5th Grade), she participated in her Public Schools poetry contest & won an award for her budding poetic talents. Her favorite subjects were, of course, reading & writing. Maxwanette performed at her first poetry recital (at The Muse, Brooklyn, NY) held by her Mother, by the age of 12. By the time she reached 6th & 7th Grades, Maxwanette was solid & firm, that Poetry was her life. She’s been writing ever since. Maxwanette is more of a “Free-Style” Poet. She follows no particular form and or style, she goes with the flow. So, Maxwanette, what is the real purpose of your page, social media outlets, etc., What makes you any different from the rest of them? “I don’t really pay attention to differences and all that. I really have no expectations. I’m not expecting anything at all. I love, love, energy, life, existing, simply being. In sharing my poems, they have indeed become the language in which my Soul speaks. It is in prose, that my thoughts, feelings, and pineal view are most expressive. Some people write journals, I write Poetry, lol! It’s also been very therapeutic for me. It is on pen and paper, that I am the freest. If I can help soothe the Soul of even 1 person, letting them know that life matters, they matter, we matter and they’re not alone, and we’re in this thing called life together… I know what you’re going through because I’m living too, we need to remember to “Share the Love”, because it’s a real thing that is forever needed, the best cushion in life, then I’ve fulfilled my purpose in this existence. 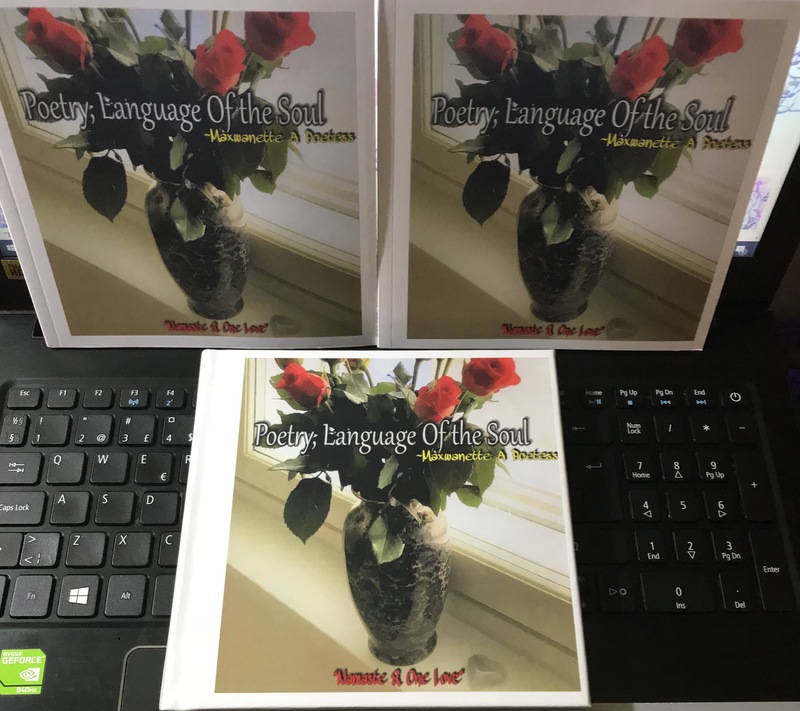 “Poetry, Language Of the Soul”, Volume I.
Maxwanette’s Poetry may cause a reaction and or response. Either or, the fact that it causes one to think and or feel? Is more than enough, says the Poetess. Many of her pieces are reflective of her own “personal” experiences and that of others. The Poetess stated, “It is those experiences within this Universe, that are expressed in my poetry.” The Artist uses some of her own pictures (of self and her surroundings) because it gives a more personal view to her words. I’m really surprised by your poetic capabilities to start writing at the age of 5 and too poetry is highly commendable. Thanks for visiting my poetry. Much appreciated. Hi Megha! You’re very welcome. Seeing how my Mother was a Published Poet, it wasn’t that difficult. Also being able to read at a high level at an early age helped. Not to leave out, how adamant my Mother was about reading & writing. In school this became a great advantage for me. I thank you for your praise, but I owe it all to Mom.